Each 5×7 card comes with a brown A7 envelope. When my son’s Godfather told me he could not find a Baptism card to go with his gift, I knew it was time to put pen to paper (or in my case, stylus to screen). 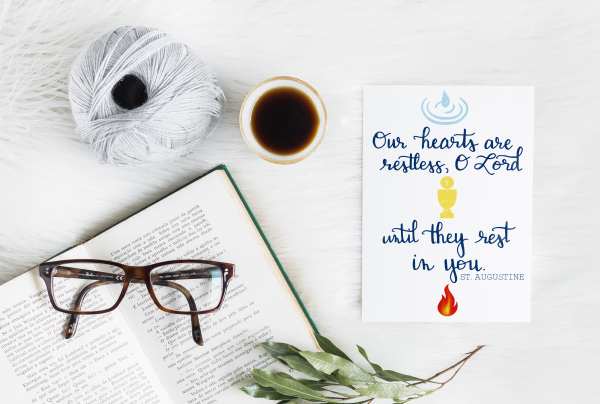 I love finding quotes from Catholic saints, books of the Bible, and other inspiration and bringing them to life as greeting cards. We are called to share our faith with others, and I hope this small ministry can help you do that. Each Annunciation Designs card is hand-lettered and illustrated digitally, then printed on smooth 90 lb paper at a local Ohio print shop for a beautiful finish. Your card will be packaged in a sturdy cardboard mailer along with a brown A7 envelope to ensure it is delivered safely to your door. Any photo props are not included in your purchase.